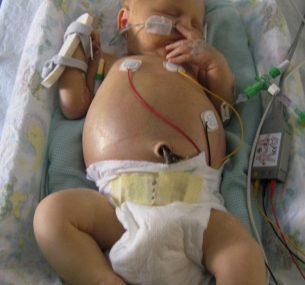 When Lucas was born in June 2010, the doctors knew immediately that something was wrong. He had a huge distended stomach and was rushed straight to intensive care at Queens Medical Centre, Nottingham. Four days later, we were told that Lucas had neuroblastoma. Neuroblastoma is the second most common solid tumour in childhood, affecting just under 100 children a year in Britain. And our little Lucas was one of them. Lucas’s mum Lydia and dad Luke stayed with him in hospital for the full four weeks, they just didn’t want to leave his side. I stayed with them for about three days, and it was a struggle just to get them to have a quick coffee or a sandwich. They had a huge fear that something would happen in the minutes they were away, but thankfully, everything was ok. Despite the difficulties and needing to give Lucas so much attention, Lydia and Luke stayed strong for their family – Lucas has a sister, Caitlin, and brother, Lathan. It was important to them that their children never felt left out, and they all pulled together as a family. Over the four weeks, Lucas’ treatment was intensive. He had eight blood transfusions, a lumbar puncture and of course, chemotherapy over three days. He stayed in hospital for another couple of weeks before he was able to come home. He still has to visit the consultant every 12 weeks until he is five years old, but the doctors are very happy with his progress. Thankfully he hasn’t had any side effects from the treatment. He was walking really quickly, he’s incredibly smart and inquisitive, and most importantly, a strong, healthy little boy. To see him now, you wouldn’t know that Lucas had been so unwell. Today, he is a very happy child – our little miracle. I remember the call from my nephew Luke telling me about Lucas. He could not say the word cancer when telling me, which is why he refers to it as the ‘c’ word in his poem. The hospital where Lucas has been treated asked for a copy of the poem which now features in the hospital ward. 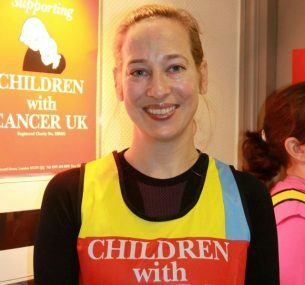 It’s because of Lucas that I ran the Virgin London Marathon in April 2012. It’s just a few weeks of training and fundraising, but for children like Lucas, my fundraising efforts could change their lives. In 2011, to try to improve survival for children with high-risk cancers like Lucas, we awarded £198,011 to help fund a new experimental cancer therapeutics programme at Great Ormond Street Hospital, led by Dr Darren Hargrave. There are lots of ways that you can help children like Lucas in their fight against cancer.